Last month, Misr International Films (Youssef Chahine) launched their highly-anticipated initiative Zawya to bring an alternative kind of cinema to Egyptian movie theatres, mainly by screening art house or independent films that normally wouldn’t find a place in the local market. The third film of the all-year programme – where a new title plays every two weeks – Zawya's current screening is Only Lovers Left Alive, American director Jim Jarmusch’s latest feature nominated for a Palme d’Or in the 2013 Cannes Film Festival. Only Lovers Left Alive is the first Jarmusch movie ever to be released in Egypt, premiering in Zawya even before its US theatrical release set for 11 April in Los Angeles and New York. In a recent interview he gave while promoting the film, Jarmusch said he’d rather be "in the margins" than in the mainstream. "Throughout history, there has always been a mainstream culture and a marginal culture, and the most innovative things are in the margins," he elaborates. In a way, Only Lovers Left Alive is about margins too, and the people who inhabit them. The film’s protagonists, two vampires who have been in love for centuries, live on the outskirts of society. They keep their identities hidden, can only go out at night, restrict their social circles to the one or two individuals they can trust, and obtain the blood supply that keeps them alive through obscure methods similar to those of a junkie attempting to score some drugs. Yet this is where the similarities between Adam (Tom Hiddleston) and Eve (Tilda Swinton) come to an end. He is an idealist and a romantic, but his firsthand observation of human behaviour over hundreds of years leaves him battling with cynicism and depression. She, meanwhile, remains optimistic despite being more grounded in reality, injecting Tom with the doses of hope he needs each time he falls prey to his dark thoughts about the world. Jarmusch has said that he views the film, first and foremost, as a "love story and character study", which is quite accurate. Even the cities where Adam and Eve live highlight the differences between them. He is a reclusive musician who resides in an eerie, desolate Detroit -- a city that has recently come to symbolise the failure of the Western industrial model. He spends his days and nights in a ramshackle house, surrounded by antique guitars and amplifiers, and is sometimes visited by Ian, the closest thing he has to a friend in the Rock n’ Roll world and his only connection to the outside world. Eve, meanwhile, leads a life of leisure in the vibrant city of Tangier, where buildings and people and public spaces mostly maintain their traditional form and where commercial decay has not yet secured its grip. Her house is filled with dusty books that she treats with wonder and care, and when she needs something done she goes out to a local café rather than stay in and have someone drop by. Although Jarmusch is notorious for refusing to analyse his work or explain his aesthetic decisions, one can always be sure that there are no coincidences in his films. Each visual choice in Only Lovers Left Alive says something about the characters and their inclinations. While Adam is invariably dressed in black, Eve's clothes are off-white. In Detroit, Jarmusch uses a mostly brownish-grey colour palette, while in Tangier the image takes on a brighter, beige hue. In one scene, during a chess game, Adam uses the black figurines, while Eve plays with the white ones. 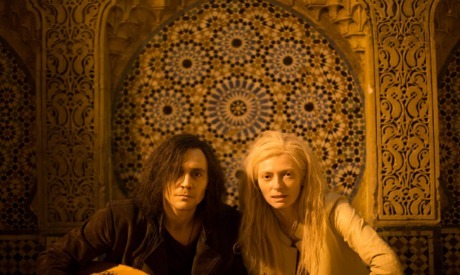 Only Lovers Left Alive may revolve around two vampires, but they are in fact, despite their immortality and blood-sucking desires, quite human. Even their names signify it: Adam and Eve, the cradle of humanity, where it all begins. The themes explored by the film are essentially human too. If you strip them of the supernatural status and examine them in a more abstract manner, you have two eccentric figures, two outsiders, struggling to get by in a world where they don’t really fit, without compromising certain values -- which is not entirely different from characters in Jarmusch’s earlier films. His Adam and Eve may have been born in the 15th century, but they eventually come face to face with the dilemma of the modern man: how to live from year to year without allowing your soul to rot amidst all the chaos, without sinking into despair. Each of them represents one side of the human experience; one pushes forward while the other retreats. At its heart, Only Lovers Left Alive is not a film about vampires, but rather the age-old questions of adaptation and survival. With two individuals at its core who'd consumed culture for centuries, the film is ripe with literary, musical and scientific references. It almost rivals fantasies like Woody Allen’s Midnight in Paris (2011), with Elizabethan playwright Christopher Marlowe (John Hurt) making an appearance as Eve’s confidante and fellow vampire. In the film, the rumour/theory that Shakespeare’s best works were in fact written by Marlowe is upheld, and he is filled with bitterness towards the literary giant, whom he refers to as an ‘illiterate zombie philistine’ (the vampires refer to humans as zombies throughout the film). Juxtaposed against Adam’s disgust towards humans’ lack of imagination and their treatment of the world, Marlowe’s presence is a perfect fit, so are mentions of Nikola Tesla and how his ideas, had they ever been executed, could have irrevocably changed our lives. Marlowe, an artist of exceptional talent, takes no credit for his work, and a man who is supposedly less gifted receives all the glory. Tesla, the brilliant scientist who came up with the foundations of technologies that we take for granted today, worked and died in the shadow of Thomas Edison – a man who never had his vision, but instead had money. In one scene, Adam mentions he is the one who composed the adagio in Schubert’s famous string quintet and gave it to him, willingly. Near the end of the film, Adam watches Lebanese singer Yasmine Hamdan perform in a Tangier coffee shop, and is in awe. When Eve suggests she will be very famous one day, Adam responds: “God, I hope not. She’s way too good for that.” Again, Only Lovers Left Alive seems like an ode to those who live on the margins, changing the world away from the spotlight. Jarmusch, whose works are famous for distinctive soundtracks that he often scores himself, wrote the coffee shop scene especially for Hamdan after he’d seen her perform and approached her to participate in the film. Hamdan’s hypnotising number is an intriguing addition to Jarmusch’s use of music in the film. The score, composed by Jozef van Wissem, is a delicious combination of the mystical and the psychedelic, where the dominant instruments are alternately the lute and the guitar (all guitar music on the soundtrack is performed by Jarmusch). Minutes before Adam comes upon the magnetic performance in the coffee shop, Marlowe greets him with a line from Hamlet: “Oh, what a piece of work is a man!” -- a reference to the monologue in the play where the prince expresses his disenchantment with humans, nature and everything else about the world. “What is this quintessence of dust?” Adam replies, quoting the same speech. He is at the epitome of his disillusionment. Yet the irony and beauty of the film lie in how Adam and Eve -- despite everything they deem to be wrong with the world, despite having already experienced it for centuries, despite being overstuffed with hundreds of years worth of knowledge -- still find within them a lust for life that pushes them to fight when faced with the threat of perishing, as they realize that – unbelievably – there is still more to see, more to feel, more to discover. Only Lovers Left Alive is about survival and adaptation, yes; but it’s also about how our small passions can sometimes save us, against all odds. I have seen many in the US watch his movies and fall into a life of sin. Drugs, foul language, formication/adultery, and atheism all play prominently into his movies. Egypt should stay away from this trash if it wants a successful future. All it does is promote sin for its people, and lead them to hell.